Fran opened the meeting welcoming the new members, Victoria Foster and Gina Cunningham. Pat Beebe, Toast Of Tampa Chairman – The exhibit / art sale is Nov. 4th at the USF Music Concert Hall lobby, 3755 USF Holly Dr. The art call went out and 6 participants have signed up. There’s room for more but it’s limited. Bamboozle – Pat Beebe is the contact for this event. This is for all paid NTAL members. Art call is going out. Space is limited to 30 pieces no larger than 16”x 20”. Installation is Jan 13. There will be lots of activities going on downtown during this month. No commission will be charged for art sold, NTAL has paid the venue fee. Diane Harm, Christmas Party Chairman – The dinner will be at Quatro, in the Tournament Players Club on Dec. 13, 6 – 9. The price for the dinner is $30. There will be 2 choices of entrees and a vegetarian dish. They will also accommodate allergies. A bar is available for drinks or bring your own wine ($10 corkage fee). There will be music, a television and an available microphone. Decorations can be put up. This is a sit-down dinner not a buffet. The round tables accommodate 6 – 8 seats. The e-mail will go out as soon as the meal choices are available. Sally Yoder, Plein Air Chairman – The next outing is a Quick Draw and Potluck at Sally’s House from 4 – 8. 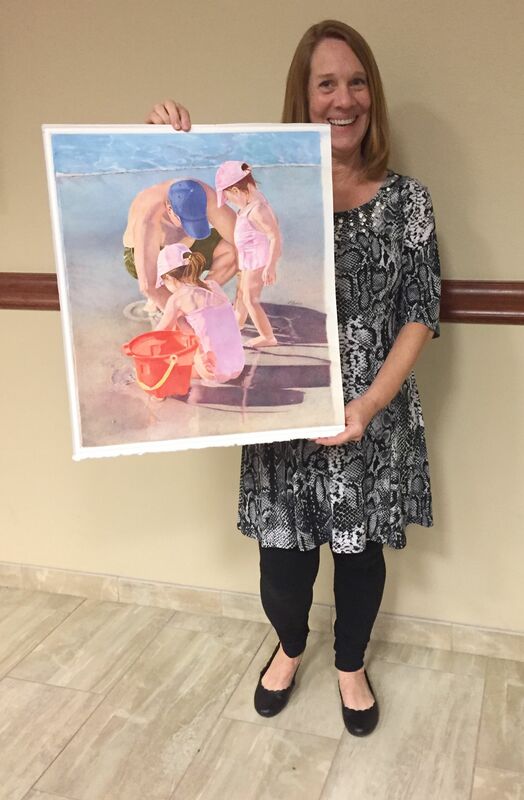 Dotty Banker sold one of her paintings that was exhibited at Hidden Springs. Paula Noblitt sold a small 8x10. Fran Byers’ Toast of Tampa Choir competed in Las Vegas and took 4th place in world. Joan Garcia has a painting in the Lightening Celebration of the Arts at Amelia Arena. Show and Tell and Featured Artist – Paula Noblitt Chairman. 12 members participated in the Show and Tell. 10 members entered to be voted for the Featured Artist. The F.A. winner is Fran Byers. Congrats! Our Nov. Program will be at the LEC. Pat Beebe will demo acrylic pouring. Participation is encouraged so bring an apron.